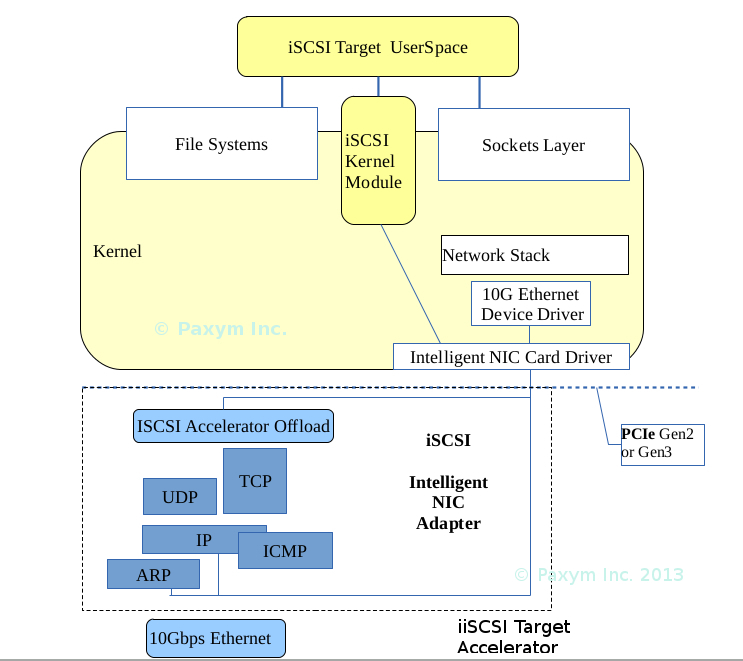 Paxym Inc.'s iSCSI Target software is a complete iSCSI Target offload implementation for Linux based iSCSI Target servers. 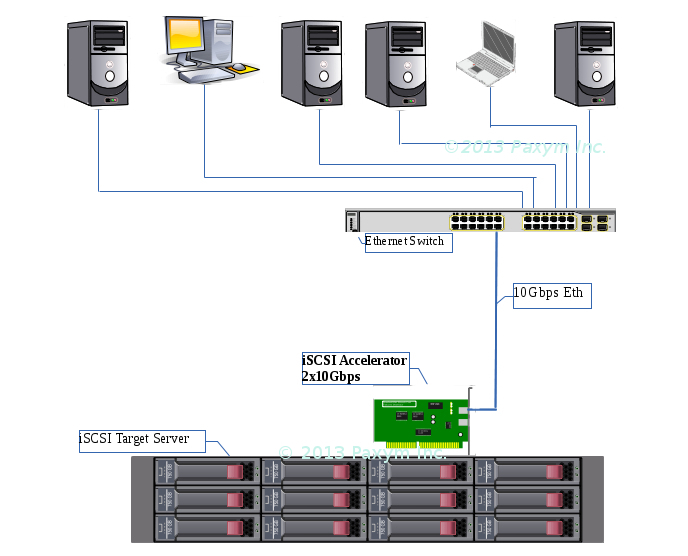 The HW/SW combined solution provides superior iSCSI target throughput, by offloading majority of Network packet processing, iSCSI stack processing and many other compute intensive task to the Intelligent Network Adapter. Available for 10Gbps and 40Gbps configurations, the iSCSI Target solution allows for passthrough of network traffic while accelerating iSCSI traffic transparently. Paxym's iSCSI Target software CPU requirements are flexible enough to perform additional network processing depending on customer's choice. e.g. Open-VSwitch offload for SDN environments, RAID offload, IPSec Security offload, FCoE etc. Paxym's iSCSI Target software is available for Cavium Network Inc.'s OCTEON and OCTEON-Plus families (CN38xx, CN56xx etc.). A port to OCTEON-II Liquid-IO (CN66xx) is undergoing qualification tests.
. Transparent NIC and Full iSCSI offload in single PCIe slave card with 10GE and 1GE SFP+ ports.
. Supports MS Windows initiator clients as well as Linux initiators.
. Real-time Message Logging and Extensive Error Reporting via host syslog.
. Verified with Microsoft Windows Hardware Ceritification Kit.
. PCIe slave card may be used in any standard OEM vendor's server e.g. HP, Dell, etc. Additional Kernel, Application, File-System Software development services are also available. Maintenance and Support contracts of 6 mo, 1 year are available. non-GPL; Paxym developed source code. No Royalty, Unlimited binary distribution for customer's specific business unit.